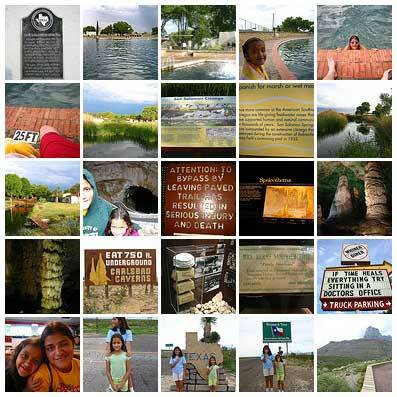 At the beginning of August the girls and I did a road trip out to West Texas with an excursion across the New Mexico line to Carlsbad. I'm a wimp about long drives and generally feel pretty wiped out just by a run from Austin to Houston or Dallas. But from the Hill Country on, I-10 is a traffic-free 80+ MPH cruise, so at least it wasn't stressful and all I had to contend with was shoulder and back pain from my unergonomic car. The girls were great -- a pile of books on tape from the library was enough to keep us all cheerful. We got through the Hitchhiker's Guide to the Galaxy, The Tipping Point (while they were reading and I had the audio faded to the front of the car), and a good chunk of The Hobbit. West Texas in August sounds like a crazy idea but I was surprised to learn that it's actually more pleasant out there than in Austin. I'd always imagined that the Davis Mountains are too puny to have cool weather but happily that's not true. The air wasn't Rockies-crisp but it was a far cry from the oven we've been living in all summer. Another cooling feature was San Solomon Springs at Balmorhea State Park, a spring-fed pool of cold, deep water full of fish. It's hidden in plain sight just four miles or so off I-10, perfect for breaking up a trip; we hit it both going out and coming back. Our major destination was Carlsbad, New Mexico, where we're fortunate to have a hospitable cousin who put us up for two nights and showed us around. We did the Caverns, of course, and also the Living Desert State Park, a native-species zoo and botanical garden worth a trip to Carlsbad in its own right. Our cousin also took us to the Fiesta Drive-In, a thriving three-screen drive-in theater which is the biggest movie venue in town. We watched "Cars", not my favorite Pixar product but an appropriate choice for a drive-in in New Mexico. After Carlsbad we returned to Texas with stops in the Guadalupe Mountains National Park and the ultra-funky Van Gogh Books in Van Horn. We ended up at the beautiful and well-run Indian Lodge in Davis Mountains State Park. It was one of those experiences, like riding Amtrak on a good day, when you get a nostalgic feeling of good will toward government and its cheerful and efficient representatives in uniform. This trip reminded me why I once wanted to be a park ranger when I grow up. From Ft. Davis we did short excursions to the McDonald Observatory and a scenic three-corner run through Marfa and Alpine. I've been hearing rumors of the hipster art colony that's sprung up in Marfa but didn't know much about it. We didn't stop because I knew it wouldn't be the girls' thing, but now I know I've got to go back, maybe one of these Octobers for the Chinati Foundation Open House. Just a quick drive through town gave me fantasies of what it would be like to live there -- a small Texas town with a pleasant climate, a sense of style, art that goes beyond bluebonnets and longhorns, and an NPR station? Who knew!